Traditional shade coffee plantations of Kodagu district, in the Western Ghats of southern India, harbor a high density and diversity of trees. Local farmers appreciate native biodiversity, but plantation economics and public policies drive them to gradually replace the original diversified cover with exotic shade trees such as Grevillea robusta, which grows fast and can be easily traded as timber. In order to identify and recommend native timber trees with fast growth rates, we compared the growth performance of four common native species against that of G. robusta, by fitting steel dendrometer bands on 332 shade trees. Results showed that in general G. robusta had the fastest growth rates, but large trees of the native Acrocarpus fraxinifolius had faster growth in the wet western side of the district. Computer projections of long term performance showed that most species were influenced by bioclimatic zone. 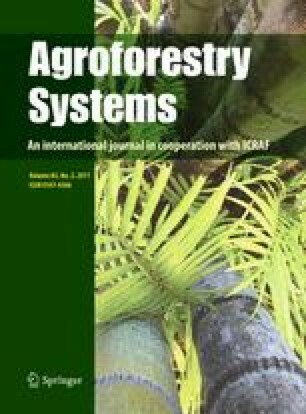 Species-specific local environmental effects also occurred, including competition from coffee bushes for A. fraxinifolius, influence of aspect for G. robusta, and management block effects for Lagerstroemia microcarpa. Our results show that native species potentially could produce timber at rates equivalent to those of exotic species. However, as in many tropical countries, data on growth rates of native trees within mixed-cover plantations are scarce and this study underlines the urgent need to screen for fast-growing species. Such information provides a strong basis for recommending appropriate changes in public policies that would improve tree tenure security and encourage farmers to grow more native species. Funding was provided by the CAFNET project of the EuropAid program of the European Union (Connecting, enhancing and sustaining environmental services and market values of coffee agroforestry in Central America, East Africa and India, CAFNET—Europaid/ENV/2006/114-382/TPS), and by a Critical Ecosystems Partnerships Fund Small Grant (to CDN) administered by the Ashoka Trust for Research in Ecology and the Environment, Bangalore. We thank the management of Tata Coffee Ltd., BBTC Ltd. (Elkhill Group), Biodiversity Conservation India Ltd., and Kabinakad estate, as well as individual farmers who permitted monitoring of trees at their plantations and participated in interviews. We also thank R. Ramalingam for preparing dendrometer bands, S. Aravajy and N. Barathan for tree identifications, K. M. Nanaya for map preparation, and A. Prathap and J. D. Murugesh for field assistance. Comments from two anonymous reviewers helped improve the manuscript.